DANG, May 1: Seven central members of CPN (Maoist Center) have submitted a joint resignation citing 'great disappointment' over the party's decision to give tickets to some 'controversial' candidates for mayoral posts of Bagchaur Municipality, Salyan. When the party announced the candidacy of Lokman Budhathoki for the post of mayor and Kalpana Pun for the post of deputy mayor, a number of local Maoist leaders accused the party of choosing 'inferior' candidates. The party's Central members from Bagchaur, Gyan Bahadur Oli, Seti Ram Oli, Hari lal DC, Tanka Prasad Sharma, Sumnima DC and Kamala Oli submitted their resignation to the party's Province Committee. “There has been great injustice while selecting candidates,” said Gyan Bahadur Oli after his resignation. 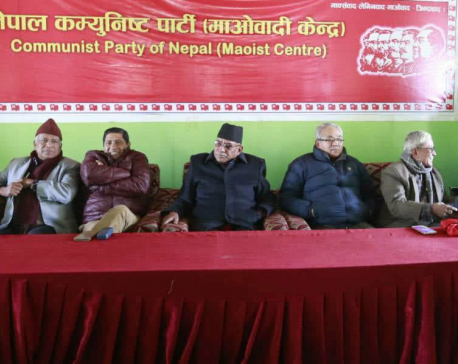 As the Province Committee of CPN (Maoist Center) had selected the candidates for the election, the agitated members have threatened to take to streets against the committee. The members have further informed that they won't be taking back their party responsibilities unless the party revised its decision. Few other members from the lower committee have also resigned from their posts in protest of the Province Committee's decision. Despite all the mess, the District Committee of the party has taken it as a controversy which was expected to take place after the announcement of candidates and have even assured that the problem will be solved very soon. “The resignation letters have been sent to the Province Committee. We have taken their dissatisfaction as normal. We are trying our best to convince them,” said Neb Bahadur Kunwar, district in-charge of the party. The situation is no different for the CPN-UML as more than hundred members have been protesting against the party's announcement of mayoral candidates for Triveni Municipality. They have even sent a letter to the party threatening to party their ways from the party. Other parties like the Nepali Congress and Naya Shakti Nepal are going through similar controversies. Almost all the political parties in salyan have fielded their candidates. There are three municipalities and seven rural municipalities in the district. As Salyan falls in Province 6, the election in the district will be conducted on May 14.